Avid players of the worldwide mobile game phenomenon Pokemon GO can now get free timely updates about where they can go to take advantage of all-day lures in pre-identified Pokestops across Metro Manila through freenet (www.freenet.ph), the free Internet platform of Voyager Innovations, Inc.
All they have to do is download the freenet app from the website, Apple App Store or Google Play Store and make sure to register for an account using their mobile numbers. 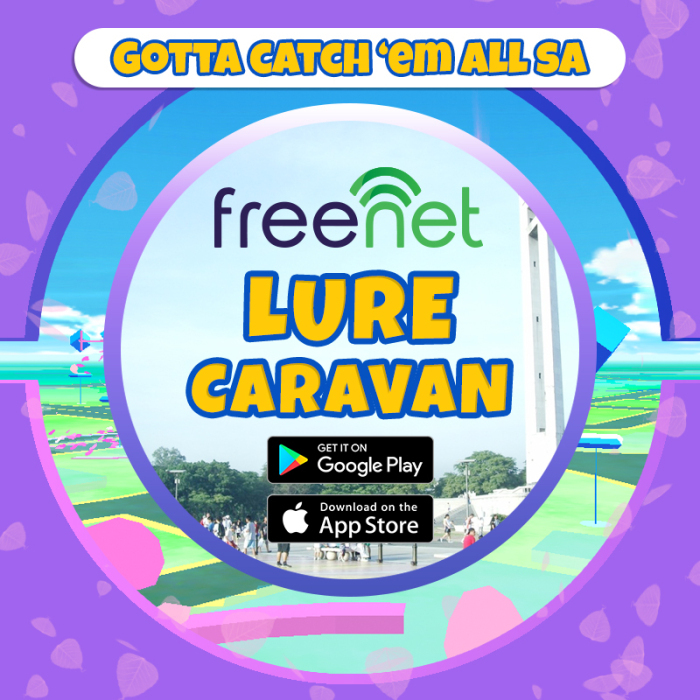 Once registered, players may check out the freenet app to be updated on when and which places they can visit to enjoy all-day lures and capture more Pokemon within the game. freenet has also collaborated with hatch, the rich mobile marketing arm of Voyager, to design the campaign and the customer experience for freenet users, who will also receive timely SMS updates about the dates and locations of the Lure Caravans in their mobile phones. “Through freenet, we’re giving more people easier and worry-free access to living a digital life, and for many Filipinos today that includes having to play Pokemon GO all day long, as much as possible,” said Heidi Garayblas, Business Unit Head for freenet at Voyager. “During the freenet Lure Caravan around the metro, we will be placing free lure modules in strategic locations in the next few weeks so that avid fans of the game can have more fun playing it. They just have to download the freenet app and register so they know when and where to be when it happens,” Garayblas added. During these dates, freenet will be deploying lure managers to routinely place lure modules–or in-game items that attract various types of pocket monsters to specific locations once activated–in pre-identified Pokestops within the metro from morning until evening. This gives players a faster way of leveling up within the game and a quicker chance to complete the 151 Pokemon available for capture in the current roster of the hit mobile game. Through freenet, Smart, TNT, and Sun subscribers will also be able to access Facebook Lite, Twitter, and Instagram for free, so they can be updated and share their Pokemon Go experience with friends anytime, anywhere. Aside from these, users also get to access dozens of apps and websites without data charges, all thanks to freenet. Initially introduced as SafeZone in 2015, freenet has opened the gates for millions of Filipino mobile users to access popular online shops, banks, airlines, food establishments, and news and entertainment portals, without the burden of data charges. To date, some 70 brands and enterprises are already using the freenet platform to allow their users to access their sites and apps for free. Players can also speed up their Pokemon GO progress by purchasing in-game items–such as Pokeballs, Lure Modules, Incense, Incubators, and Lucky Eggs–through Pokecoins, which they can easily purchase with the help of PayMaya. Players only have to download the PayMaya app on the Google Play Store or the Apple App Store, load up their accounts with at least P60 to cover the standard app store verification fee, and link their virtual VISA card to their app store accounts to be able to make in-app purchases for Pokecoins. And before heading out to catch all the Pokemon around the city, trainers can complete their Pokemon gear by ordering power banks, running shoes, and rain gears through Takatack, one of the country’s largest online marketplaces.